Glasgow School of Painting, "Glasgow Boys"
Characteristics of Scottish Post-Impressionism: "Glasgow Boys". styles, see: History of Art.  What Was the Glasgow School? What Was the Glasgow School? In Post-Impressionist painting, the term "Glasgow School" (or Glasgow Boys) commonly refers to a loose group of progressive artists who introduced modern art to Glasgow during the period c.1880-1900. These artists were united by their rejection of the hierarchy of genres plus their distaste for the conservative academic art of the Royal Scottish Academy in Edinburgh. Concerned with depicting country life and work, several had worked in France, at Pont-Aven, Grez-sur-Loing, and other centres of plein-air painting, and were familiar with Barbizon landscape painting and the Impressionism of Claude Monet, as well as the Worpswede ruralism of 19th century German art. However, in general, they inclined more towards the naturalism of the Hague School - the dominant force in Post-Impressionism in Holland (c.1880-1920) - than the ephemeral colourism of Monet. Among their most famous members were James Guthrie (1859-1930) and John Lavery (1856-1941). They exhibited successfully in London, Europe and the United States during the 1890s, and eventually joined the RSA, injecting it with much needed vigour. 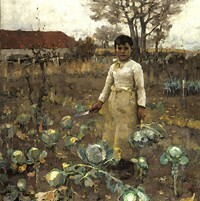 A typical masterpiece from this group is A Hind's Daughter (1883, National Gallery of Scotland) by James Guthrie. The term Glasgow School also embraces a second group, active slightly later in Scotland (c.1890-1910), which coalesced around the architect and painter C.R Mackintosh. Its members were attracted chiefly by decorative art, in the style of Art Nouveau and fin de siecle Symbolism. A typical masterpiece is Mackintosh's watercolour painting, Harvest Moon (1892). In the 1880s the artistic leadership of Scotland passed decisively to young artists associated with Glasgow. The 1870s and 1880s were times of great expansion of exhibiting, the Royal Scottish Academy on occasion showing over a thousand works in its annual exhibition. However, the success of the Academy was an Edinburgh success and it was difficult for artists who had not set up their studios in the capital to make an impression. One reaction to this was the establishment of the Glasgow Institute as an exhibiting body in 1861, an initiative complemented by the patronage available as a result of Glasgow's growing commercial and industrial strength. It is symbolic of this westwards shift that the most innovative paintings being made in the 1880s by Edinburgh-based artists were those of artists with their origins in the west, namely William McTaggart and a painter strongly influenced by him, James Lawton Wingate (1846-1924). The passive state of the Academy led, eventually, to the setting up in Edinburgh in 1891 of the more radically inclined Society of Scottish Artists. But in the late 1870s the most promising young painter from the east of the country, Arthur Melville (18551904), shared a vision of what painting could be with like-minded counterparts in Glasgow. Although Melville remained distinct from it, he is often considered along with this Glasgow School. These artists were to dominate the 1880s with an intimate approach to landscape painting and portrait art which owed much to the Hague and Barbizon schools on the one hand and to Whistler on the other. Those at the heart of this Glasgow School - often referred to as the "Glasgow Boys" - were Robert Macaulay Stevenson (1854-1952), James Paterson (1854-1932), William York Macgregor (1855-1923), John Lavery (1856-1941), George Henry (1858-1943), James Guthrie (185.9-1930), William Kennedy (1859-1918), Edward Arthur Walton (1860-1922), Joseph Crawhall (1861-1913), Alexander Roche (1861-1921), and Edward Atkinson Hornel (1864-1933). The sculptor Pittendrigh Macgillivray was also associated with the group and on its periphery were painters such as David Gauld (1865-1936), Stuart Park (1862-1933) and also older artists such as James Elder Christie (1847-1914) and Thomas Millie Dow (1848-1919). One must also mention the talented but short-lived Bessie MacNicol (186.9-1904), who, although she was a few years younger than the others, makes clear the limitation of the term "Glasgow Boys". An innovative contemporary whose life and work remained relatively distinct was the Paisley watchmaker John Quinton Pringle (1864-1925). Also of interest here is James McLachlan Nairn (1859-1904) who was very much part of the Glasgow School before leaving for Dunedin in 1890. Subsequently, along with the Dutch painter Petrus van der Velden (18361913), he helped to establish Post-Impressionism in New Zealand. In a complementary role to the Glasgow School artists was Alexander Reid (1854-1924), one of the most perceptive dealers in European art of his day. Reid shared accommodation in Paris with Van Gogh, and Vincent painted a fine portrait of him in 1886. Reid was both a source of information for the Glasgow Boys about developments on the Continent and an advocate and supporter of their work. What united the Glasgow School as artists was a distrust of the mountain and moorland spectacles that had been pioneered by Horatio McCulloch, developed by Peter Graham and John MacWhirter and made routine by numerous imitators content to paint heather and hill and Highland cattle. By contrast the Glasgow Boys looked to France, the new centre of gravity of European art. At this time Glasgow collectors were showing considerable interest not only in the Hague School in Holland but also in the artists of Barbizon - such as Theodore Rousseau (1812-1867), Camille Corot (1796-1875), Jean-Francois Millet (1814-75) and Charles-Francois Daubigny (1817-1878) - indeed they were at the forefront of collecting in Britain in this respect. NOTE: Despite the dominant reputation of 19th century French landscape painting, as exemplified by the Barbizon School, it is worth remembering that the English painters John Constable (1776-1837), JMW Turner (1775-1851), and Richard Parkes Bonington (1802-28) exerted a major influence over Barbizon and other plein-air painters. See also: English Landscape Painting (c.1700-1900). Other important influences came from south of the Border, not least through the experience of William York Macgregor as a student of Alphonse Legros at the Slade. Macgregor was among the eldest of the Glasgow Boys and had an informal leadership role, for classes held in his studio were a key meeting point. But while Macgregor was educated at the Slade, Walton studied in Dusseldorf and then at Glasgow School of Art, where he met Guthrie who subsequently studied with Pettie in London. Hornel studied first at the Trustees' Academy in Edinburgh (by then almost defunct), and then at Antwerp, while Alexander Roche went to a few classes at Glasgow School of Art and then to Paris where he studied under, among others, Gerome. The group is thus notable for its interplay of differing educational influences from different art schools located mostly in Glasgow and in Paris. James Paterson, for example, was almost wholly Paris-educated, while George Henry studied in Glasgow, both at the School of Art and with Macgregor. Arthur Melville studied at the Royal Scottish Academy Schools in Edinburgh and subsequently visited Paris. John Lavery studied in Glasgow and London and at the Academie Julian and Atelier Colarossi in Paris. On the other hand Crawhall's education was almost informal. Another influence was McTaggart, although it can be noted that many of McTaggart's finest works were made in the 1880s and 1890s and are thus contemporary with Glasgow School activity. In addition the concern of these painters with exploration of balanced tonal values across a relatively constricted scene contrasted markedly with McTaggart's emphasis on the sea and the horizon, although their concerns do relate to village and farm scenes by McTaggart, and to similar subjects by Chalmers and Cameron. Reflecting the influence of Barbizon (and McTaggart), the Glasgow School was the first group of Scottish artists to be committed to plein-air painting in the open air. The effect of this was predictable but profound. The artistic geography of Scotland changed as it was explored by painters, not for romantic backdrops to be sketched and then finished in the studio, but for places in which it was possible to settle down and observe during the summer months. In the late 1870s and early 1880s Paterson and Macgregor favoured the east coast around Fife and Kincardineshire, while Walton, Crawhall and Guthrie preferred the Roseneath peninsular in the Firth of Clyde and subsequently - along with George Henry - Brig o'Turk in the Trossachs. In due course, Cockburnspath in East Lothian, Moniaive in Dumfriesshire, and Kirkcudbright were also favoured places. Outside Scotland Lavery, Kennedy and Roche made their base from 1883 in the French village of Grez-sur-Loing, near Fontainebleau, where they joined an international community of artists, many of whom were influenced by Jules Bastien-Lepage (1848-84). Active there were kindred spirits such as William Stott of Oldham and the Irishman Frank O'Meara (1853-88). The importance of Grez in the development of Lavery's work in particular is hard to overestimate. He derived much from Stott and O'Meara, indeed the latter became a close friend. Lavery's paintings of rowers on the river and figures on the bank around the bridge at Grez are subtle essays in backlighting, reflected light and muted sunlight. The originality of these works lies also in Lavery's interest in the figure in active movement and he developed this back in Scotland in The Tennis Party (1885). Although the group thus split into French-based and Scottish-based wings, the inspiration of Corot, Millet and in particular of Bastien-Lepage was felt equally by all. These shared influences did not lead to a lessening of individuality. For example, although both Lavery and Guthrie owe much to Bastien-Lepage, Lavery's gently recreational bourgeois idylls contrast markedly with Guthrie's uncompromising representation of rural life and work. Guthrie's famous work, A Hind's Daughter (1883), was a follow up to his painting Highland Funeral finished the year before. A Hind's Daughter is a remarkable example of the absorption of French painting and its transformation in a Scottish context. It is a straightforward and unsentimental work - much more so indeed than was typical of Bastien-Lepage - which develops a direct language of oil paint in which marks of brush and palette knife are evident, a style which was echoed in Macgregor's Vegetable Stall (1882). These works are as far as possible removed from the smooth finish of earlier but still living painters such as Joseph Noel Paton (1821-1901). Guthrie and Macgregor were concerned with the objective nature of both subject and medium. One of the consequences of this sort of approach throughout Europe was a growth in regard for the painting as an object in its own right, rather than simply a representation of a scene or an idea, and the stylistic ruggedness of these painters contributes to this. Such features can be seen also in Walton's A Berwickshire Fieldworker (1884). Attention to the nature of paint also led to a consideration of decorative qualities and Glasgow School work was acclaimed for its "decorative harmony" when it was exhibited in Munich in 1890. Such harmony can be seen in Arthur Melville's early works such as Audrey and her Goats (1884-89). The painting, which takes its subject from Shakespeare's As You Like It, is a statement about nature, literature and art worthy of John Ruskin, for Audrey is the least 'artful' and most 'natural' of all Shakespeare's characters. The decorative trend was carried further in the work of George Henry and E.A.Hornel. They combined a lightening of palette with an increased emphasis on what has been described by Hornel's biographer Bill Smith as "abstracted colour rather than observed colour". Here the example of the French painter Adolphe Monticelli (1824-86) was important. Monticelli was popular in Glasgow and of great interest to dealers like Reid. His works foreshadow the almost tapestry-like effect of paint that Henry and Hornel developed, although Monticelli has little in common with the sheer energy of composition found in works by Hornel from 1891, such as The Brook and Summer. Compositionally these owe much to Japanese Ukiyo-e Woodblock Prints and the popularity of Japonism - the late-19th century craze for Japanese art. The same is true of George Henry's important Galloway Landscape (1889), which unifies a direct approach to landforms with a consciousness of the decorative possibilities of two-dimensional form. This approach resonates with the contemporary explorations of Breton landscape by Paul Gauguin (1848-1903). The work of the London-based American painter Whistler (1835-1903) was a subtle and continuing presence for the Glasgow School, and it was largely through Walton's efforts that Whistler's Carlyle (1872-73) was acquired for the municipal collection of Glasgow in 1891. Whistler had helped to transmit an enthusiasm for Japanese art to Britain, and Henry and Hornel took this further for they visited Japan itself, leaving early in 1893 and returning a year and a half later. This journey was made possible by financial support from Alexander Reid and the collector William Burrell and a number of notable works resulted, including Hornel's Kite Flying, Japan (1894) and Henry's Japanese Lady with a Fan (1894). The wider Japanese influence in Scotland was to be felt in due course in the designs of Charles Rennie Mackintosh and his colleagues. It was also present in the linearity of illustration favoured by Celtic Revival artists in Edinburgh; indeed a Japanese drawing by Hornel appears in 1895 in the magazine of that movement, The Evergreen. This interaction of interests, the one exotic, the other historical is characteristic of the time. Henry and Hornel had made a direct contribution to revivalist Celtic art with their collaborative paintings The Druids: Bringing in the Mistletoe (1890) and The Star in the East (1891). It should also be noted that John Lavery contributed to the Celtic Revival process in Irish art of the 1890s. For the purposes of this article Lavery is considered as very much part of the Scottish tradition but although he moved to Scotland as a young child he was born in Belfast and from the early years of the twentieth century he had a second career as one of the best known Irish artists. He is now regarded as one of the most continental of Irish landscape artists, as well as one of the most talented Irish portrait painters: in short, one of the great modern artists of his day. Among a number of his remarkable portrait paintings are those of Ramon de Valera (1921) and a portrait in death of Michael Collins (1922). His most clearly Celtic Revival work is a portrait of his wife as Kathleen ni Houlihan (1927) which formed part of a design for a bank note. Lavery was by this time living in both Ireland and in London, where - like his contemporary, William Orpen (1878-1931) - he was in demand as a society portrait painter. Other Glasgow School painters had also found a high-level of success. Walton, like Lavery, had established a reputation in London, as had Guthrie. The latter was appointed President of the Royal Scottish Academy from 1902 to 1919, and this indicates more than anything else the complete acceptance by the Scottish art world of the Glasgow School, although most of their more important works had been painted by about 1895. See also: English Figurative Painting (c.1700-1900). In the early 1890s a younger group of artists, designers and architects gathered round a fellow student at the Glasgow School of Art, Charles Rennie Mackintosh (1868-1928). In 1891 James Guthrie himself had reckoned that watercolours of Italian churches by Mackintosh were the best of an exhibition of student work and had been distressed to hear that he was studying architecture. Although Mackintosh is primarily remembered as an architect, Guthrie's endorsement is a useful reminder of his outstanding ability as a painter. Guthrie's activities as a judge were not the only link between Mackintosh and the painters of the Glasgow School. David Gauld was a close friend and Bessie MacNicol studied at the School of Art at the same time, while E.A.Walton's brother, the designer George Walton (1868-1933), was a contemporary. All the more fascinating then is Mackintosh's distinctiveness as an artist. His imaginative symbolism is breathtaking in early water-colours such as Harvest Moon (1892). Working with him were his future wife Margaret Macdonald (1863-1933) and her sister Frances (1874-1921). Another colleague was his fellow architecture student, Herbert MacNair (18681955), who was soon to marry Frances. This group, The Four, had a central role in the development of what became known as the Glasgow Style. The co-operative nature of this venture is manifest in poster art, such as the Poster for The Glasgow Institute of the Fine Arts (c.1896), which at first glance one might think of as typical of Mackintosh but is in fact the work of Margaret Macdonald, Frances Macdonald and Herbert MacNair. Margaret Macdonald in particular has now been given some of the individual credit she deserves as an artist for works such as the oil and tempera Opera of the Sea (c.1916), originally designed as one of a pair of gesso panels in 1903. The Four opened the way for a wider group of Glasgow Style artists involved in graphic art and applied art, which included the illustrators Jessie M. King (1875-1949), Katherine Cameron (1874-1965) and Annie French (18721965), as well as the embroiderers Jessie Newbery (1864-1948), Ann MacBeth (1870-1948) and Muriel Boyd (1888-1981). (See also: Tapestry Art.) Among other figures of interest were the painter Agnes Raeburn (1872-1955) and her sister Lucy (1869-1952), who edited the informal magazine which brought together some of the most important early work by The Four. This blossoming of activity owes much to the Cornish painter Francis Newbery (1855-1946), who had been appointed as director of Glasgow School of Art in 1885, indeed the importance of his contribution as a teacher can be compared to that of Robert Scott Lauder. Part of his achievement was to create a situation in which women were able to excel and in due course to take leadership roles. Several, including his wife Jessie, went on to head their respective areas at the School of Art. The wider context for the development of the Glasgow Style was shipbuilding and engineering. This was not simply a question of a commercial climate that made money and patronage available. Nor was it simply a question of the School of Art catering for highly skilled practitioners of design and crafts needed in the fitting out of ships. It was really a question of the aesthetics of marine architecture. These artists and designers had their childhood in the heyday of the Clyde-built tea clippers that are still a standard of beauty in ship design (the Cutty Sark was launched in 1869). As they became adults, elegant and technologically pioneering transatlantic liners such as the City of New York were being launched. Since the modernist designer Le Corbusier (1887-1965) published Towards an Architecture in 1923, the inspirational effect of the transatlantic liner on the design of the 1920s has been taken for granted. (See, for instance, the Art Deco design movement.) The effect of living in the city at the heart of the world's shipbuilding industry should be given equal consideration with respect to the artists of the Glasgow Style, a generation earlier. Direct artistic influences on the development of this style were diverse. Japan has been mentioned and the lectures and books of Glasgow-born Christopher Dresser were a further means of transmission of Japanese ideas. Although more inclined to formal experimentation, the artists of the Glasgow Style took as part of their conscious aesthetic foundation the ideas of the Arts and Crafts movement as put forward by William Morris (1834-96) and Walter Crane (1845-1915) in the previous generation. Mackintosh in particular was influenced by the writings of the Arts and Crafts architect John Sedding, some of whose words he made into a personal motto: "There is hope in honest error, none in the icy perfections of the mere stylist." In 1901 these words were made by Mackintosh into an image which looks forward to the aesthetic of the Bauhaus design school a generation later. The influential London-based magazine The Studio, which had its roots in the Crafts movement, was an important source of contemporary visual thinking. It made available stylistic experiments such as those of Aubrey Beardsley (1872-98) and, of particular importance to the Glasgow artists, Jan Toorop (18581928), the Dutch-Indonesian pioneer of the plant-inspired forms of Art Nouveau imagery. (See also: Jugendstil.) The Glasgow Style artists united these sinuous abstractions with their sensitivity to the exactness of proportion inherent in the practical geometrical tradition of Glasgow engineering. This unity can be seen in Mackintosh's 1904 design of the order desk chair for Miss Cranston's Willow Tea Rooms in Sauchiehall Street. The form of this chair is based on the radically geometrized form of a willow tree. This work and others from the same period, such as the Revolving Bookcase for Hous'hill, bring to mind Ruskin's formal analysis of tree and leaf in Modern Painters and resonate with the explorations of Piet Mondrian a few years later. The intense quality of this aspect of Mackintosh's work could not be clearer than in his structurally informed watercolours of flowers, which he made throughout his career. The Studio publicized the Glasgow Style as early as 1893, when the refurbished Glasgow Art Club, for which Mackintosh was mainly responsible, was reviewed, although Mackintosh himself was not named. In 1896 and 1897 the editor of The Studio, Gleeson White, wrote an influential three-part assessment entitled Some Glasgow Designers, beginning an advocacy that was to last twenty years, including the special publication, Jessie M. King's Seven Happy Days for Christmas (1913). A further influence was the Celtic Art Revival movement, which Thomas Howarth has called "one of the most potent stimuli in the evolution of the Glasgow style". Mackintosh's first executed design in stone, dating from 1888, was itself a link back to this Scottish past, a simple Celtic cross in memory of a colleague of his father. This grave marker took its place among many other Celtic crosses in the Glasgow Necropolis, all of which refer back in style to the Celtic High Crosses of Iona and Islay, of the eight and ninth centuries, or the later work of the West Highland School. The Necropolis also contains a fine gravestone in developed Glasgow Style from some twenty years later, designed by Mackintosh's friend Talwin Morris (1865-1911), who must also be mentioned. Morris had been closely involved with art magazine publishing in London and had come to Glasgow as art director with the publisher Blackie; it is members of the Blackie family that the gravestone commemorates. He was a designer of brilliance and produced book covers of characteristic Glasgow Style, uniting geometry with natural forms and abstract Celtic designs, including Celtic interlace designs and spirals. It was through these mass-produced book covers that the Glasgow Style became familiar on an everyday level throughout the British Empire. Talwin Morris also played a key role in convincing Walter Blackie that Charles Rennie Mackintosh should be commissioned to design Blackie's new house overlooking the Clyde at Helensburgh. The result, Hill House (1902-4), has an importance in early twentieth-century domestic design which is perhaps only matched by the Prairie School Robie House (1909), created by Frank Lloyd Wright in Chicago, and Adolf Loos' Steiner House (1910) in Vienna. One of the earliest to appreciate the merits of the Glasgow Style was the German cultural attache Hermann Muthesius, who described Mackintosh in 1902 as one of the geniuses of modern architecture. Muthesius is now recognized as a major commentator on the development of twentieth-century design and through him there was substantial German interest in the Glasgow Style artists. Their work became well known in German-speaking countries through the magazines Dekorative Kunst and Deutsche Kunst und Dekoration; indeed the latter commissioned cover designs from both Jessie M. King and Margaret Macdonald in 1902. (See also: German Post-Impressionism.) A strong link was forged with Austrian artists of the Vienna Secession (1897-1939), and The Four created a room for the 1900 Secession Exhibition which met with high acclaim and illuminated the shared domain of understanding between the Glasgow and Vienna artists. A key part of this shared understanding was that both groups had developed their pioneering modernism within a matrix of awareness of myth, legend and history. Works by members of the Glasgow School of painting can be seen in some of the best art museums in Britain and Europe. We gratefully acknowledge the use of material from Murdo Macdonald's lovely book entitled Scottish Art (Thames & Hudson, 2000).  For a chronological guide to the evolution of modern painting, see: History of Art Timeline.  For information about painting in Scotland, see: Homepage.